The smart scooter has an integrated digital screen that prompts all vehicle data and diagnostics, and can be paired with its mobile app to enable features such as predictive service prompts and geo-fencing by tracking the scooter's location. Twenty Two Motors, a Gurgaon-based Indian startup, has launched its first scooter, Flow. Launched at Auto Expo 2018, the Flow scooter offers a connected digital dashboard, a Lithium-ion battery-powered DC motor and a mobile app to control the scooter's connected features. The Flow is now up for pre-orders, and will be made out of the company's upcoming manufacturing facility in Bhiwadi, Haryana. The company intends to produce 50,000 units out of its factory every year, and will begin with an experience centre in Gurgaon before branching out to the rest of the country. The Flow electric connected scooter has a digital dashboard that it uses to show standard information like speed, range and battery status, along with vehicle dynamics, service requirements and other settings. Twenty Two Motors has not made it clear if the system will also be equipped with music playback via Bluetooth headset and/or navigation, but the system is equipped with Bluetooth to pair to Android and iOS devices via a mobile app. This app will connect the user to the scooter at all times, and with integrated GPS on board the scooter, will also come with remote geo-fencing, which will enable the user to define a safe area. In case of theft, the app will automatically draw GPS data from the scooter and alert the owner in case it travels outside of its designated safe area. 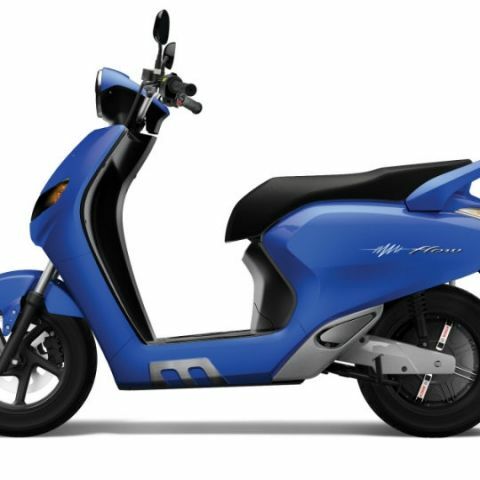 The Flow is also an all-electric scooter, and has options for either single-battery or dual-battery powertrains. It is equipped with a DC motor, which delivers 90Nm torque and is capable of travelling at peak speed of 60kmph. The single-battery pack will have total range of 80km, and take up to five hours to charge fully. The dual-battery variant will obviously take longer to charge, but claims to deliver twice the total range of travel. The Flow is equipped with front telescopic suspension, disc brakes and electronic braking system with regenerative charging. The scooter also gets boot space of 24 litres and all LED lamps, along with cruise control and drag mode. The Twenty Two Motors' Flow is priced at Rs. 74,740, and will be up against the likes of the Vespa Elettrica and Okinawa Praise once it rolls out to the customers in the near future. While Vespa presents a familiar brand to customers but has a limited range of 100km for now, the Okinawa Praise has garnered acclaim for being a well-balanced proposition in terms of speed of travel, total range and the overall proposition. With the Twenty Two Motors Flow now in the fray, electric scooters in India are growing in frequency, and it remains to be seen how they are received on road. Wait for One plus two?